GRP Laminates has announced a new concept, the MSV Explorer. The MSV Explorer sits 1.2M under the surface of the ocean and provides 360 degree views. Electrically propelled to reduce its impact on marine ecosystems, the highly maneuverable MSV Explorer can be easily controlled by single or dual joystick, or remotely controlled from the launch and recovery catamaran. 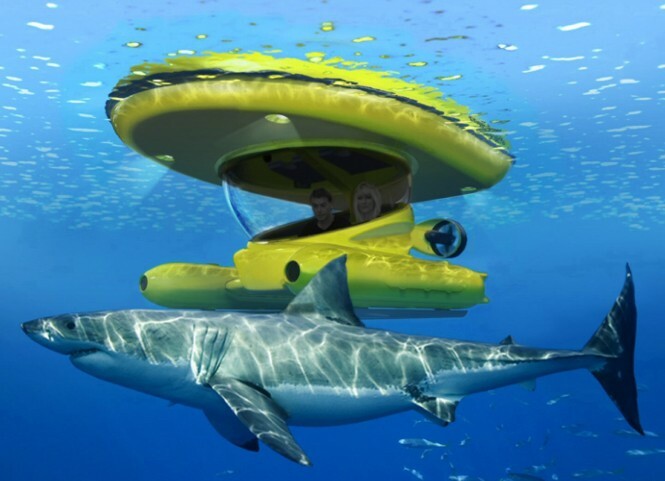 It has an all-day operating capacity (7.5 hours operation at full speed) allowing for a full working day underwater, and a truly unique experience for users. Although the MSV-Explorers look like mini subs, they are in fact surface water craft, designed to place two observers in an acrylic cockpit at a constant 1.2 m below the surface of the ocean, providing a complete panoramic sub surface view of the marine environment without the need for scuba gear or any form of specialist training. Simply push the joystick and go in any direction, with a 360 degree, turn on its own axis capability. Still, I'd rather have a shark cage. Heh, at first I thought the thing was mounted on the shark. Now that would have been awesome! Dang, this thing would be so cool to take a ride in. Where do I sign up for a tour? That's awesome! I really hope they're cheapish to make and that they can get these set up at all of the resorts, etc. I want to try one so bad. Hooolly CRAP thanks for the nightmares!